When I see that someone shares something I’ve created, It makes me think that something I wrote resonated and the person sharing makes me recall the Edmund Burke and Eldridge Cleaver quotes found in the header and at the very bottom of this post. Maybe what I wrote, was just something with which they agreed. Perhaps it was something the reader didn’t know before I shared and now they do, and they want others to know. Maybe it identified something they believe needs changing. Or, needs to be thought about more. Or, needs to be discussed in the open. So, I love it when people share my work. You never know where a seed planted today might end up and how it might blossom and positively influence someone (and dog training), somewhere. So SHARE IT with your veterinarian, vet techs, dog groomers, dog trainers, companion dog owners, people that might become companion dog owners – SHARE IT! People in the industry know that companion dog training and dogs are being adversely by extremist views regarding methods and tools. This radical agenda is perhaps the most important and biggest reason to consider sharing. If these radical extremists are the only one sharing information with the general companion dog public, new dog trainers, veterinarians and veterinary technicians, the industry and dogs are going to continue to be adversely affected. So, when you come upon what you feel is a well-reasoned perspective of what real dog training is (and isn’t), whether it is something I or someone else has written, combat the extremists by sharing it with as many people as you can as often as you can. Don’t be afraid of sharing the truth. You will find it opens up far more doors than it closes and the doors that it closes only led to closed minds and were not worthy of your time. Sharing thought-provoking information will often trigger discussion (which you are always welcome to deflect my way). Dialogue is a good thing and precisely why I write. Just commit to a rational conversation that is inspired by the desire to educate, as opposed to conquering and you’ll be fine. 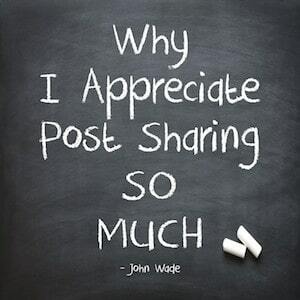 So, it may seem that a small thing like clicking share and adding a supportive, encouraging comment to a Facebook, Twitter, Instagram, Youtube, Vimeo or Linkedin post but, I assure you it isn’t. It can have an impact. The more that share, the higher the chances of an impact. Imagine the implications for companion dog training and subsequently companion dogs if more people shared thought-provoking articles then did not.